We had the pleasure of playing at the dinosaur park with friends Seth, Cy, and Kaelin last week. The three of them are such good friends and always have a good time together. 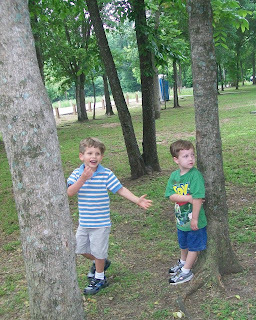 Dawson asking Seth to come over to the playground to play. 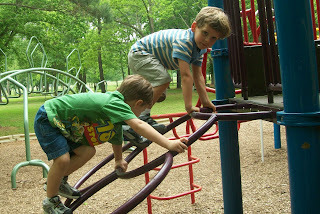 Seth and Dawson climbing one of the ladders. 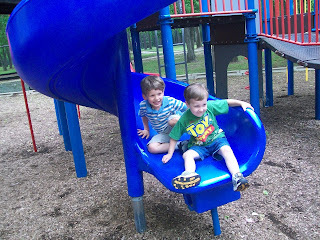 Seth and Dawson going down the twisty slide. 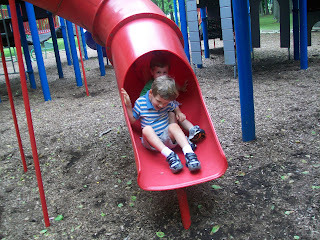 All 3 kids - Dawson, Seth, and Kaelin - come down the tunnel slide.